What is Lambert’s Turmeric 10,000mg? 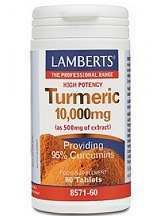 Lamberts Turmeric 10,000mg is a natural turmeric-based remedy that lays claim to being a strong and pure turmeric extract. Some of the health benefits the product is claimed to confer are the ability to relieve joint-related challenges, the facilitation of healthy cholesterol levels and a cardiovascular system, prevention of inflammation, enhancement of digestive processes, the offering of protection for liver protection, fighting off obesity, and promoting the proper flow of bile. The purpose of this review is to provide you with the factual information you need to make a smart purchasing decision. This supplement is made with natural ingredients. The active and inactive ingredients of the supplement are listed below. 500mg of turmeric root extract providing 95% curcumins. Tablet Coating: Hydroxypropyl methylcellulose and glycerin. The manufacturer has recommended that users take one tablet per day. However, if it is necessary, they may take a second dose. But the circumstances under which a consumer may take the second dose are not clearly spelled out. The product comes in a bottle of 120 tablets at the cost of $43.75. However, the company does not provide any discounts for buying in bulk. It is also possible to buy bottles containing only 60 capsules for $24.97. So far, we have not found any adverse side effects that are associated with this product. However, all expectant and nursing mothers are supposed to consult a doctor before they use this product. Moreover, turmeric can affect consumers who have problems with blood clotting. Lastly, it is prudent for users to discontinue the supplement as soon as they develop any form of allergic reaction to one or some of its components. It is unfortunate that this product does not have a money-back guarantee the way some other turmeric supplements do. The lack of assurance leaves buyers with nothing to resort to if the product fails to work as expected. Additionally, there are no reviews on the manufacturer’s website to prove the efficacy of the supplement among its existing users. To sum up the review, we can say that Lambert’s Turmeric is a good product that has strong natural ingredients in its formula. In addition, the supplement is reasonably priced. However, there are a few missing links that may prompt a buyer to explore other options. First, the product does not have a money-back guarantee the way other supplements within its price range do. The lack of such an important assurance may make a new user feel like they are engaging in a risky venture. Second, the product comes with ambiguous dosage instructions, and this situation can expose users to possible overdosing. For example, the manufacturer vaguely advises consumers to take a second dose “if it is necessary” without clear explanations regarding those necessitating circumstances.